"There is another family unsketched, which for numerical force outranks all others in this county. We refer to the Broadwater race. But it will be impossible to go much into details in a single article, so we will have to content ourself with general outlines. The most remote ancestor was Cornelius Broadwater. He was born in England and emigrated to Louden county, Virginia, in early life where he died in old age in 1804, leaving four sons, and four daughters. The latter married and remained in that county. The sons were Charles, William, Guy and Samuel. All moved to Allegany county, Md., about the year 1807, and settled not far from Savage river - a very hilly - even mountainous country, then almost a total wilderness; but the hills and rocks were more to their tastes, than dislikes. They wanted productive soil, and this they found by instinct as it were. Their habit was to buy cheap lands and make them valuable by hard labor. The old race did not covet, or even care for level or bottom lands. The came from the hills near Blue Ridge and they clung to such throughout life. Some of the third generation drifted to West Virginia, and you may be sure they are among their natural elements. But a few of the name ever sought the rich flat lands of the West. They all believed in getting rich slowly and honestly, and also in holding tight to what they got in the good old slow way. But several of them have been relieved of some of their hard earnings by midnight committees. One of these robberies is now the subject of criminal investigation. Charles Broadwater was born in Virginia in 1778, and died in 1859, aged 81 years. He was not large in stature, but remarkably hard, tough and industrious - a farmer of course - of hills at a slant of about 45 degrees. He served in the war with Great Britain of 1812, in Capt. Thomas Blair's company - was one of the "Old Defenders" of Baltimore. But "Old Charley" like a true soldie[?] was not in the habit of boasting of what he did for his country. He left a widow "Beckey" who died only a few years since at great age, much respected. It was announced at the time that her progeny ran high up in the hundreds. Charles and his good wife were the parents of eight sons and four daughters. The former are: Amos, Jefferson, William C., Samuel, Peter, Ephraim, Charles and Ashford. One of the sisters being the wife of John Warnick, one of Garrett county's oldest and most respectable citizens. 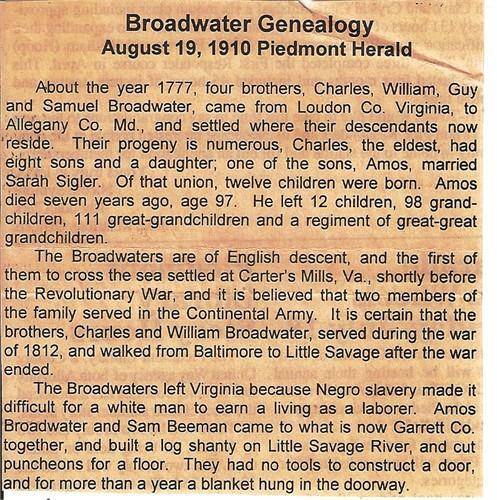 Amos Broadwater is now the living Abraham of the race - born August 9th, 1804. Still hale and hearty, with but little signs of old age, mounts his horse and can ride to Oakland or Cumberland like a man of 40. He had retired from farming but not entirely from business - can drive as sharp a contract as he ever could and he never was band in a trade. Always strongly Democratic - never splits his ticket., A candidate once or more for the Orphans' court, for the mere honor of the thing as he termed it. The family are Democratic by nature, but here and there a Republican puts in an appearance to destroy family monotony. There is about the same unanimity in religion - Methodist to the core. "Uncle Amos" stands high in the temple; can make an old fashioned prayer and sing one of Dr. Watts' ancient hymns with as much earnestness as any deacon in his church. He is proud of his children and descendents - boasts of 12 living children 93 grand, and 57 great-grand children. Has been the husband of Sarah (Sigler) 63 happy but changeable years. A union lasting thierteen years beyond the jubilee period. Only recently the whole civilized world united in a glorification of Queen Victoria because she had reigned wisely over a great nation for fifty prosperous years. But here is an unbroken family reign of the same husband and wife for 63 years. Such a rare instance of matrimonial unity and longevity deserves a neighborhood celebration. May these favored two aged people enjoy many more such years, as are numbered in the far and near past. William C. Broadwater, another son of Charles is quite a prominent member of the name. He is sometimes called "King Billy" on account of his prominence and wealth. He too, is a farmer, without any other combination, but he broke away from the highlands of the Savage some years ago, bought and moved upon the Shultz farm at Grantsville. This is a genial farm, but it would hardlly have filled the discriminating eye of the purchaser were it not for the bluffs that look down upon the curves of the Casselman. He practices farming in an intelligent and judicious manner upon the southern division of "Cornucopia" - named 113 years ago after the fabled overflowing horn. King William is approaching his four-score, but in good physical and mental condition - a widower for several years with a large family of sons and daughters, grown and well situated in life. His son James is a successful and enterprising merchant in Grantsville. Josephus, an older son, owns a nice farm on Manadeers ridge - is well fixed on that inviting elevation, and is a first-class citizen. Several of these boys have experimented a little in politics, but not to an extent to hurt which they are sure to do if tampered with too long. Practical politics have been made one of the great vices of the day. Old William Broadwater lived and died on Savage creek about the close of the war - aged 83 years a farmer first, last and all the time of his steep acres. He liked them because they rewarded him for his many years of toil. He, too, served in the war of 1812, and was a member of Capt. McLaughlin's company. He had six sons and four daughters, all comfortably settled and respectable, but scattered. There are not lands enough between Savage and Meadow mountains to serve the industrious hands of the multiplying Broadwaters. This respectable man died from that most dreaded disease, cancer, a slow and tortured death. Guy, the third brother lived in the same neighborhood nearly all his life, and died early in the late war at the age of 82, was married twice and had ten children. The writer does not know much of them. They have become a good deal dispersed. Samuel, the last of the four old brothers lived not far off in the "Backwoods" a farmer like the rest, incapapble of any other occupation. He died in 1864, aged 75, and left two sons and two daughters. The two last of the old brotherhood were not so well known generally as the two former. Their descendants are numerous but scattered. Here is a rare case of four brothers living in the same vicinity whose death ages combined amounted to 321 years - an average of over four score. Where is there another like it? These men in their more early years were strong, active, enduring and lively, not averse to some of the mirths and enjoyments of the old time life. At least two of them could use the violin in a manner that would soon put profane feet in jovial motion, and, indeed, some that were not exactly so inclined. Upon the whole, this quartet of aged men did well and deserved well in their day and generation, and their memories should be referred to with kindness and consideration. There is no feature in religion or cultivated civilization more graceful than for this generation to respect, defer to, and even take silent counsel from the wisdom and goodness of the past generation. "Honor thy father and mother all the days of thy youth.," This is not only beautiful but the highest and deepest religion. The Broadwater race have become so numerous in the course of four generations that it would be impossible here to go into particulars beyond these now given, but it can be said with truth and propriety, that as a race they have been and are honest, industrious, thrifty and law abiding. You would search in vain among legal or judicial proceedings, whether civil or criminal, for any record of a discreditable character as to their lives or doings."